With over 20 stores and outlets nationwide, All Japan Budogu is the fastest growing Kendo and martial arts equipment manufacturer and supplier in Japan. Kumamoto prefecture is famous across all of Japan for its high population of Kendo practitioners, as well as for raising many of the country’s top-level players - and it is in Kumamoto where our flagship store and headquarters are based. In recent years, our deluxe ‘All Japan Pitch’ brand Bogu has become a common sight in Dojos and tournaments across Japan, and now worldwide - with many top-level teachers, and even national team members relying on our products for their Kendo practice and competition. 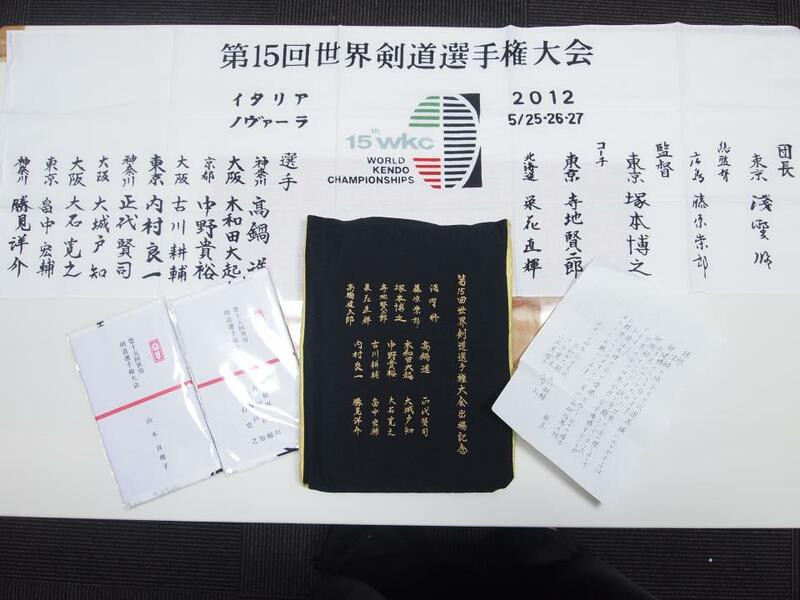 photo: Presents and thank-you letters we recieved from the Japanese National Team who represented Japan at the 15th World Kendo Championships in Italy, 2012 - Several of the team members were using our original 'All Japan Pitch' brand Bogu throughout the tournament. The reason for our success is obvious : we provide the best quality products in Japan - for reasonable prices. Many people ask, if the quality is indeed so good, then why are you not more expensive? Our answer is simple - unlike most large Kendo equipment suppliers, all of our staff members love Kendo, and we want our customers to enjoy Kendo as we do - whatever their level - using top quality and comfortable equipment. Further, it’s a fact that production costs have fallen dramatically in recent years, for us this means better prices - not fatter profits! We have over 20 members of staff at our Kumamoto flagship store, and we are all working hard to prepare, inspect, package and ship our products worldwide - and we all want to provide you with impeccable products and service! After enjoying much success on the Kumamoto Kendo circuit during his high school and university years - including placements in several prefectural and inter-prefectural championships - Takahiko decided to make Kendo his life. He began his journey into the world of Budogu, and became a craftsman at one of Kyushu’s most famous Bogu companies. After several years of dedication, he became fully proficient in the manufacturing of Kendo Bogu, and is one of the few people left in Japan who can completely construct a Bogu set single handed. After launching All Japan Budogu, with the vision of providing the world’s kendo practitioners with top quality Bogu, he maintains a hands-on approach in the company, delivering direct training to our team of craftsmen both here in Japan, and in our overseas workshops. Masashi has been hand crafting Bogu and Kendo equipment in various parts of Kyushu for over 40 years, and has crafted Bogu for numerous top-level competitors and teachers over that time. He became well known for playing a key role in the development of a new design of Kote, which later went on to become the ‘Yoroi-gata’ type Kote which is now offered by many suppliers worldwide. In addition to his skill and experience as a craftsman, Masashi has achieved the rank of 7th dan in Kendo, and has participated twice in the 7th dan Championships, and also represented Kumamoto prefecture the All Japan Seniors’ Championships. Despite his comparatively young age, Norio is already one of the most famous craftsmen in Japan. He comes from a well-known family of Bogu craftsmen, and even as a small child, he was helping out at his father's workshop in Miyazaki prefecture. By the time he was a teenager, Norio was able to completely construct a Kendo Men from scratch - arguably the most difficult part of Bogu construction, and although he is now still only in his mid 20's he has more experience, and more expertise than many Japanese craftsmen much senior in age, who often also seek his advice. Our flagship store and headquarters are based in northern Kumamoto City, in Kumamoto Prefecture, Kyushu, Japan. At any one time we have over 10,000 Shinai and over 1,000 Bogu sets for you to choose from, in our newly reformed retail area, and we often welcome visitors from across Japan, and now the World! Located a short drive from Kumamoto’s city center and tourist attractions – such as Kumamoto castle – we would be pleased to welcome you should you have the opportunity to visit us. Further, if you do find yourself in the area, and would like to visit, please get in touch and we will do our best to arrange transportation for you if required.